Thymocyte development proceeds through two critical checkpoints that involve signaling events through two different receptors, the TCR and the pre-TCR. These receptors employ two families of protein tyrosine kinases to propagate their signals, the Src and Syk families. Genetic and biochemical evidence has shown that the Src family kinases are critical for normal T cell maturation. ZAP-70, a Syk family kinase, has similarly been implicated as a critical component in thymocyte development. Although genetic evidence has suggested that Syk is involved during thymocyte development, a definitive study of Syk expression has not been performed. In this paper we report our reanalysis of Syk expression in subpopulations of murine and human thymocytes by intracellular staining and flow cytometry using anti-Syk mAbs. Syk is expressed at increased levels during the stages in which pre-TCR signaling occurs. Furthermore, Syk is down-regulated after the pre-TCR checkpoint has been passed. Syk may play an important role in thymic development during pre-TCR signal transduction. Finally, incomplete down-regulation of Syk expression was noted in human thymocytes, offering a possible explanation for the distinct phenotypes of mice and humans deficient in ZAP-70. Development of the TCR-αβ lineage of T cells proceeds through an ordered series of stages defined by the expression of various cell surface markers (1). Immature thymocytes enter the thymus as CD4−CD8− cells and develop into CD4+CD8+ thymocytes. These cells then undergo TCR-dependent positive and negative selection and become CD4+ or CD8+ thymocytes that form the mature αβ T cell repertoire in the periphery. In mice, CD4−CD8− thymocytes can be further subdivided according to the cell surface expression of two other proteins, CD44 (Pgp-1) and CD25 (α-chain of the IL-2 receptor) (2, 3). The earliest pro-thymocytes are CD44+CD25−; these cells subsequently up-regulate CD25. Next, these thymocytes become CD44−CD25+, during which time the β-chain of the TCR is rearranged and expressed on the cell surface as a heterodimer with the pre-Tα (pTα)4 chain. The CD4−CD8−/CD44−CD25+ thymocytes that receive a pre-TCR signal progress through an intermediate CD4−CD8+ stage before becoming CD4+CD8+ thymocytes (4, 5, 6, 7, 8). Productive β-chain rearrangement and membrane expression of the pre-TCR is detected via a signal that is transduced through the pre-TCR complex; the nature of this signaling is poorly understood but probably involves the Ras pathway (9). However, the signal appears to be independent of a pTα or β-chain ligand (10). This critical checkpoint in thymocyte development requires two families of protein tyrosine kinases (PTKs), the Src family of PTKs, including Lck and Fyn in T cells, and the Syk family of PTKs, comprising Syk and ZAP-70. These kinases act in a sequential manner to transmit signals from the pre-TCR and TCR complexes (11). The TCR and pre-TCR heterodimers are components of multimeric complexes containing noncovalently associated signal transducing CD3 subunits γ, δ, and ε, as well as a ζ-chain dimer (11). The signal transducing subunits recruit cytosolic tyrosine kinases for their signaling function. This function is initiated by a Src family kinase that phosphorylates the immunoreceptor tyrosine-based activation motif which is present as a single copy within each of the CD3 chains and which is present as three copies within the ζ-chain. These phosphorylated tyrosines subsequently serve as docking sites for the tandem SH2 domains of both Syk and ZAP-70. In ex vivo isolated thymocytes, ZAP-70 or Syk are pre-bound to the ζ-chain because it is constitutively phosphorylated (12). The Syk family kinases are activated by tyrosine phosphorylation of their activation loops and transduce further signals for T cell development, activation, and differentiation. Genetic studies have demonstrated the importance of both families of tyrosine kinases for the development of murine thymocytes. Mice doubly deficient for Lck and Fyn exhibit a profound block in development at the CD4−CD8− stage, the time at which pre-TCR signals are required (13, 14). ZAP-70-deficient mice have thymocytes that are arrested at the CD4+CD8+ stage (15, 16, 17). Syk-deficient mice have no reported αβ T cell defect, although a subset of γδ T cells, contained in intraepithelial lymphocytes, is impaired in their development (18). However, Syk has been shown to be expressed at higher levels in the thymus and is down-regulated in the periphery, suggesting that it might play an unrecognized role at some point during thymocyte development (19). Moreover, thymocytes doubly deficient in Syk and ZAP-70 are arrested at the CD4−CD8− stage (20), probably reflecting a partial ability of Syk to compensate for ZAP-70, but only at the first thymic developmental checkpoint. Despite this suggestive genetic evidence that Syk plays a role during thymocyte development, a definitive expression analysis of Syk in thymocytes has not been performed. Syk has been shown to be able to compensate for ZAP-70 in many situations, including αβ T cell development and signaling (21, 22). However, recent evidence has indicated in vitro and in cell lines that Syk and ZAP-70 have different requirements for activation. For instance, Syk has less dependence on Src kinases for its activation (23, 24) and, as mentioned above, has a distinct distribution within the T cell lineage. Thus, Syk may have roles distinct from ZAP-70 in certain in vivo situations. In humans, ZAP-70-deficient patients have been described (25, 26, 27). However, unlike in mice, in which thymocytes are completely arrested at the CD4+CD8+ stage, human patients with a ZAP-70 deficiency have T cells that are exclusively CD4+ in their peripheral blood. Studies with HTLV-1-transformed thymocyte lines from these patients indicate that Syk is increased in expression in those cells when compared with lines made from normal thymocytes, suggesting that Syk can compensate for the loss of ZAP-70 function in these patients (28). Nevertheless, the mature CD4+ cells that populate the periphery in these patients are unable to signal. In this paper we use an intracellular staining method for detecting Syk expression in subpopulations of cells. We have analyzed the expression of Syk in thymocytes of both mice and humans. These results suggest that Syk is expressed at the highest levels during the pre-TCR signaling stage and is down-regulated quickly thereafter, suggesting that Syk may play a role in propagation of the pre-TCR signal. These studies also suggest that observed differences in Syk expression in murine and human thymocytes may contribute to the distinct phenotypes seen in ZAP-70-deficient mice and patients. The mAb 5F5.2 was generated by standard protocols (29). Briefly, BALB/c mice were immunized i.p. with TiterMax adjuvant (CytRx, Norcross, GA) and keyhole limpet hemocyanin (KLH)-conjugated anti-Syk peptide corresponding to aa 306–333 in murine Syk. Mice were boosted with KLH-Syk peptide three times over 2 mo. A final boost was given i.v. via tail vein injection and spleens harvested 3 days later. Fusions were performed with the Ag8.653 murine hybridoma fusion partner using polyethlyene glycol, grown in selective medium (hypoxanthine/aminopterin/thymidine), and screened by ELISA. Positive clones were then subcloned by limiting dilution and rescreened for stable, high-level secretion. The 4D10.1 mAb was generated by similar methods. In this case, the Ag was a human Syk-derived peptide corresponding to aa 314–339 (30). Mice were maintained at the University of California, San Francisco, Animal Care Facility. Wild-type C57BL/6 mice were obtained from The Jackson Laboratory (Bar Harbor, ME). lck−/fyn− mice (13) and RAG-1− mice (generous gifts of Dr. Nigel Killeen, University of California, San Francisco, CA) have been described. Human thymic tissue was obtained from pediatric cardiac surgery patients between 1 wk and 8 years of age. The following Abs with the following specificities were used: rabbit heterosera, 1598, anti-ZAP-70; anti-Fgr; anti-Hck (anti-Fgr and anti-Hck were gifts of Dr. Clifford Lowell, University of California); mAbs 1F6, anti-Lck; 5F5.2, anti-murine Syk; 4D10.1, anti-human Syk. Abs against cell surface markers were obtained from PharMingen (San Diego, CA), anti-CD44, anti-mCD4; from Becton Dickinson (San Jose, CA), anti-hCD3, anti-hCD4, anti-hCD8; and from Caltag (Burlingame, CA), anti-mCD4, anti-mCD8, anti-hCD19, anti-mCD25, anti-mB220. Streptavidin conjugates were obtained from PharMingen (streptavidin-allophycocyanin, APC) and from Caltag (streptavidin-tricolor, TC). 5F5.2 Ab was dialyzed against iodination buffer and reacted with IodoBeads (Pierce, Rockford, IL) and 1 mCi carrier-free [125I]sodium iodide according to manufacturer’s instructions. Reactions were stopped upon removal of the IodoBead reagent. Free radioisotope was removed using a dextran matrix desalting column (D-Salt Columns, Pierce). Conjugation of affinity purified 5F5.2 and 4D10.1 mAbs to FITC (Molecular Probes, Eugene, OR) was performed as described (31). Cell were lysed in 1% Nonidet P-40 lysis buffer containing 10 mM Tris (pH 7.6), 150 mM NaCl, and protease and phosphatase inhibitors as previously described (12). Protein content of lysates was determined using the Bio-Rad (Hercules, CA) protein assay reagent; values were determined using a spectrophotometer. Lysates were resolved by SDS-PAGE and transferred to polyvinylidene difluoride membranes (PVDF; Immobilon-P, Amersham, Arlington Heights, IL). Blots were blocked with nonfat milk powder and BSA and incubated with the appropriate primary Ab. Following washes in Tris-buffered saline plus 0.05% Tween-20, blots were incubated with HRP-conjugated secondary Abs. Bands were visualized using the enhanced chemiluminescence system and autoradiographic film (ECL, Amersham). Tissues were strained through a wire mesh to generate a single-cell suspension. Cells were washed multiple times with PBS, resuspended in staining buffer, and stained with the appropriate conjugated Abs in the presence of normal mouse serum (10 μg/ml) or Fc blocking Ab, 2.4G3. Cells were then fixed in 4% paraformaldehyde in PBS and washed. Ab for intracellular staining was added in staining buffer + 0.1% saponin in the presence of normal mouse serum or Fc blocking Ab. Cells were washed in permeabilization buffer and analyzed by flow cytometry. Four-color analysis was performed on a FACStarPlus (Becton Dickinson). All other samples were collected on a FACScan (Becton Dickinson). Results were analyzed using CellQuest software (Becton Dickinson). A total of 250 μg of purified anti-CD3ε Abs (2C11) was injected i.p. into lck−/fyn− or RAG-1− mice in PBS. After 7 days, thymi were removed from the mice and stained for Syk expression as outlined above. Results were analyzed by flow cytometry on a FACScan. DNA samples were extracted from whole preparations of adult murine thymocytes. PCRs were performed in a final volume of 30 μl and included a maximum of 50 ng of template DNA, 1 mM of each primer, 200 μM of each deoxynucleotide triphosphate, and 0.2 U of Taq DNA polymerase (Expand PCR Kit, Boehringer Mannheim, Indianapolis, IN). Reaction mixtures were run on a 1.5% agarose gel, blotted to nylon membranes (GeneScreenPlus, New England Nuclear, Boston, MA), and hybridized with 32P-labeled oligonucleotide probes. The oligonucleotides and PCR conditions used for the analysis of TCR-β rearrangements and TCR-α rearrangements were performed essentially as described (32, 33). Before the analysis of the relative levels of TCR gene rearrangements, the quality and the quantity of DNA present in each sample were checked by amplifying the nonrearranging trithorax gene (MTrx1; see Ref. 34). Previous experiments have shown that, for the concentration of template and the PCR conditions used, the product yield is directly proportional to the input of target sequences. At least two sets of independent experiments were performed for each sample. Hybridizing bands were quantitated using a PhosphorImager (BAS1000; Raytest, Courbevoie, France). Results of each mouse are expressed as the percentage of rearrangements measured in wild-type mice after normalization for input DNA. The results presented correspond at the mean value of rearrangements for two independent Vβ-Jβ amplifications (Vβ5, Vβ8) and three independent Vα-Jα amplifications (Vα2, Vα5, and Vα8). Because Src and Syk family members are critical in the normal development of thymocytes (13, 14, 20), we were interested in determining the relative expression levels in thymocytes of a number of hematopoietic lineage-specific Src family kinases, as well as the expression of the Syk family kinases Syk and ZAP-70 in these thymocytes. To analyze the expression of the Syk PTK in thymocyte development with greater sensitivity and specificity, we generated a mAb, 5F5.2, against the murine protein. This Ab is specific for a peptide sequence in interdomain B of murine Syk, aa 306–333. Immunoblot analysis of whole cell lysates using [125I]iodinated 5F5.2 Ab revealed that it reacts primarily with a 72-kDa protein present in large amounts in murine spleen and lymph nodes and, to a much lesser extent, in the thymus (Fig. 1⇓A). This band was not detected in 3T3 cells, a murine fibroblast line (Fig. 1⇓A). The reactivity against the 72-kDa band is specific, as it was competed away with peptide against which the Ab was generated (Fig. 1⇓A). The minor reactivity to a 40-kDa band that was competed completely with peptide may represent a degradation of product of Syk has been observed by others, including in the initial description of Syk (35). A faint nonspecific band in the 45-kDa range was not reproducibly observed. Using this Ab, we were also able to detect Syk expression by immunoblotting in a murine B cell line, Bal-17, and a murine macrophage line, RAW 264.7 (data not shown). Furthermore, the 5F5.2 Ab is specific for murine Syk, as it did not detect Syk in human or avian cells (data not shown). Characterization of the 5F5.2 anti-Syk mAb. A, Blotting specificity of 5F5.2. Equivalent amounts of whole cell lysate (100 μg protein/lane) were loaded in each lane and resolved by 10% SDS-PAGE. After transfer to PVDF membranes, blots were probed with [125I]iodinated 5F5.2 Ab (left panel, anti-Syk) or [125I]iodinated 5F5.2 Ab preincubated with competitor peptide (right panel, anti-Syk + pep). Results were visualized by autoradiography. Lanes were loaded as follows: lanes 1 and 5, NIH 3T3 (3T3); lanes 2 and 6, wild-type thymus (Thymus); lanes 3 and 7, wild-type spleen (Spleen); lanes 4 and 8, wild-type lymph nodes (LN). B, Syk expression in thymi from different lines of mice. Thymi from the indicated lines of mice was isolated; whole cell lysates were normalized for protein content and resolved by SDS-PAGE. Gels were transferred to PVDF membranes and probed with the indicated Abs. The lanes were loaded as follows: lane 1, wild-type thymus (N. Thymus); lane 2, lck−/fyn− thymus (Lck/Fyn−/−); lane 3, RAG− thymus (Rag−/−); lane 4, wild-type spleen (N. Spleen). Thymocytes in RAG-deficient and Lck/Fyn-doubly deficient mice are arrested at the same CD44−CD25+ CD4−CD8− stage of development (Refs. 13, 14 ; also see below). 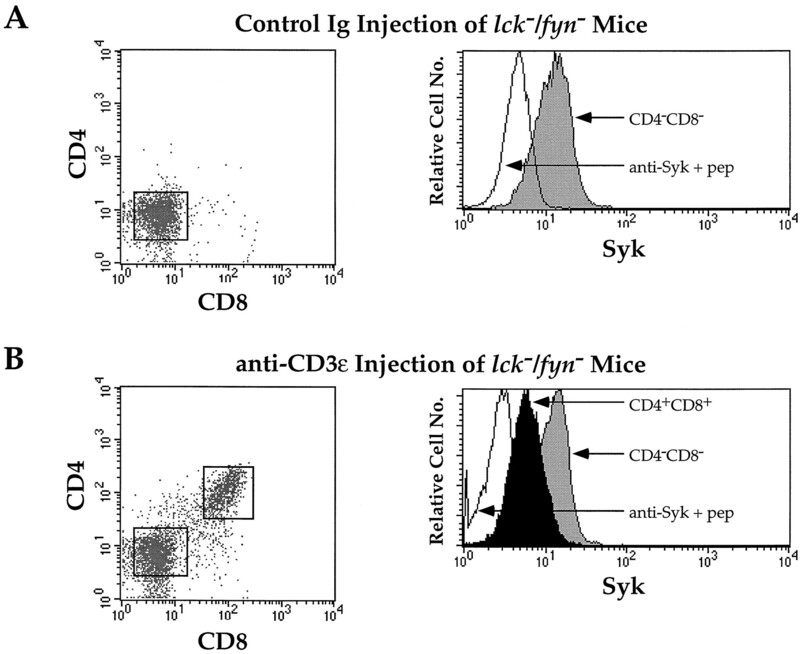 During studies of thymocytes of developmentally arrested Lck/Fyn doubly deficient mice, we used immunoblotting to examine the expression of other Src family as well as Syk family PTKs in the CD4−CD8− thymocytes of these mice (Fig. 1⇑B). Strikingly, in whole thymic preparations, we detected high levels of expression of the Src family kinase Fgr, as well as high levels of expression of the Syk PTK (Fig. 1⇑B). The same pattern of expression was observed in thymic preparations from RAG-deficient mice (Fig. 1⇑B). It is possible that the high levels of expression of these kinases reflects the increased proportion of dendritic cells, macrophages, and stromal cells in the lysates due to the decreased number of thymocytes in the developmentally arrested thymi. However, the high level of Syk might reflect the level of expression of Syk in the developmentally arrested thymocytes. A detailed analysis of Syk expression in the thymocyte subsets has not been performed, with the exception of one study from our laboratory which relied on a heterologous antiserum and immunoblotting of bulk populations (18). To examine the expression of Syk with greater sensitivity and to detect Syk expression specifically at a single cell level within discrete subsets of thymocytes from a whole thymic preparation, we decided to try intracellular staining with the 5F5.2 mAb. This technique has been used extensively for the detection of cytokine expression. Briefly, cells were stained for surface markers and were subsequently fixed, permeabilized with saponin, and stained intracellularly with the anti-Syk Ab. Cells were then analyzed by flow cytometry. 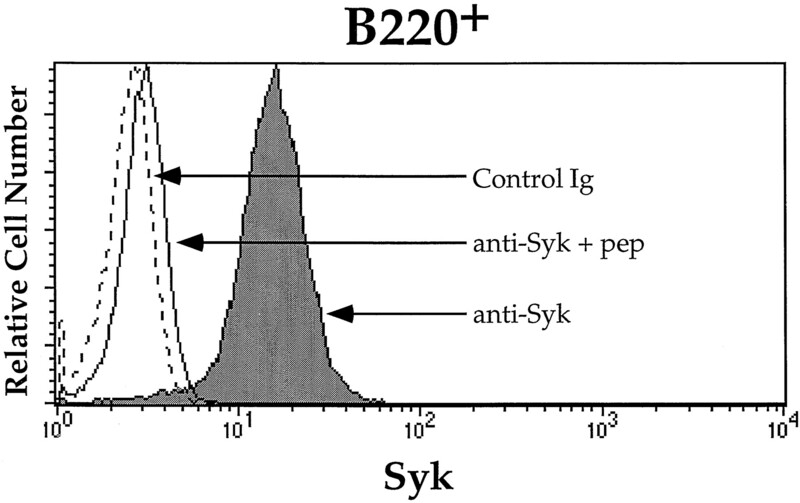 Syk expression could easily be detected in B220+ splenic B cells (Fig. 2⇓), which express high levels of Syk. Consistent with the immunoblotting results, intracellular staining for Syk revealed high levels in macrophages and low levels in peripheral T cells (data not shown). The staining observed with this mAb is specific, as we have shown with several controls. First, mAb staining could be competed away with the Syk-derived peptide against which the Ab was generated. Furthermore, an isotype-matched Ab control overlapped with the negative peak of the peptide competition control (Fig. 2⇓). Similar to the reactivity observed in immunoblotting, the anti-Syk reagent did not recognize Syk from human or avian cells when used for intracellular staining (data not shown). Finally, no reactivity was seen when nonpermeabilized cells were stained with the anti-Syk reagent, indicating that the Ag recognized by the Ab is an intracellular protein (data not shown). Intracellular staining for murine Syk. Splenocytes from a wild-type C57BL/6 mouse were stained with anti-B220 PE and 5F5.2 FITC (anti-Syk); 5F5.2 FITC + competitor peptide (anti-Syk + pep); or an isotype-matched staining control, IgG1 FITC (Control Ig). B220+ cells were gated and analyzed for Syk staining. The results shown are representative of four independent experiments. Based on experiments using rabbit heterosera, we previously reported that in the T cell lineage, Syk is expressed at higher levels in thymocytes than in peripheral T cells (19). To investigate Syk expression in thymocyte subsets and to try to understand the unique functions of Syk in the thymus and its ability to only partially compensate for the loss of ZAP-70, we stained for intracellular levels of Syk in murine thymocytes. We costained thymocytes from wild-type mice for CD4, CD8, and Syk and used flow cytometry to define the subsets of cells expressing Syk (Fig. 3⇓A). 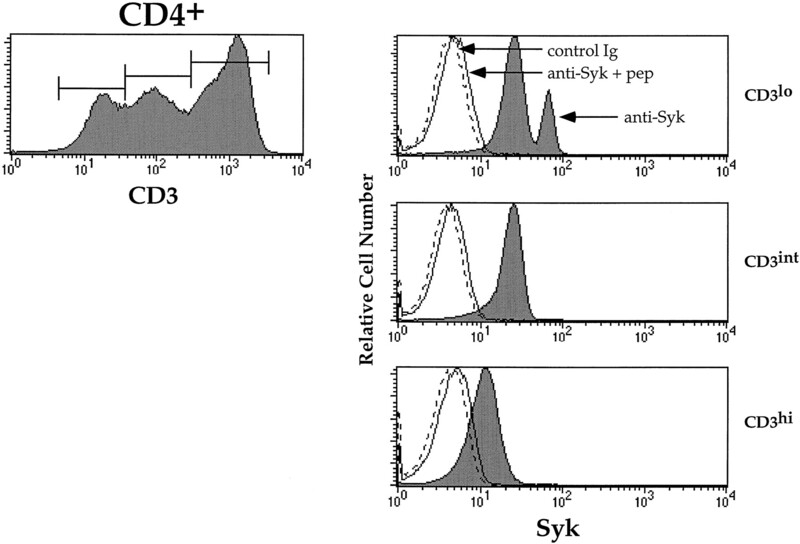 Interestingly, Syk was expressed at variable levels in CD4−CD8− thymocytes, with a subpopulation of CD4−CD8− cells expressing relatively high levels of Syk (Fig. 3⇓A). These cells were not contaminating B cells, NK cells, or macrophages, since we excluded those B220+, NK1.1, or Mac-1+ populations, respectively, by fluorescent gating. Furthermore, the majority of cells that expressed high levels of Syk were not exclusively γδ cells. Although γδ T cells do express significant levels of Syk in the thymus, after gating on CD3− populations, as well as after directly excluding γδ TCR-expressing cells, we could still detect a Syk-expressing population in the CD4−CD8− cells (data not shown). Syk is expressed in murine CD4−CD8− thymocytes. A, Intracellular staining for Syk in murine thymocytes. Thymic tissue from a wild-type C57BL/6 mouse was isolated and stained on the cell surface using anti-CD4 APC, anti-CD8 PE, anti-B220 TC, and anti-Mac-1 TC Abs. TC-positive cells were excluded by fluorescent gating. Syk expression in the different CD4/CD8 subpopulations is depicted in the histograms to the right of the dot plot. The histograms represent the following intracellular stains: anti-Syk 5F5.2 FITC, filled histogram (anti-Syk); 5F5.2 FITC + competitor peptide, open histogram, solid line (anti-Syk + pep); isotype-matched IgG1 FITC staining control, open histogram, dashed line (control Ig). The results shown are representative of five independent experiments. 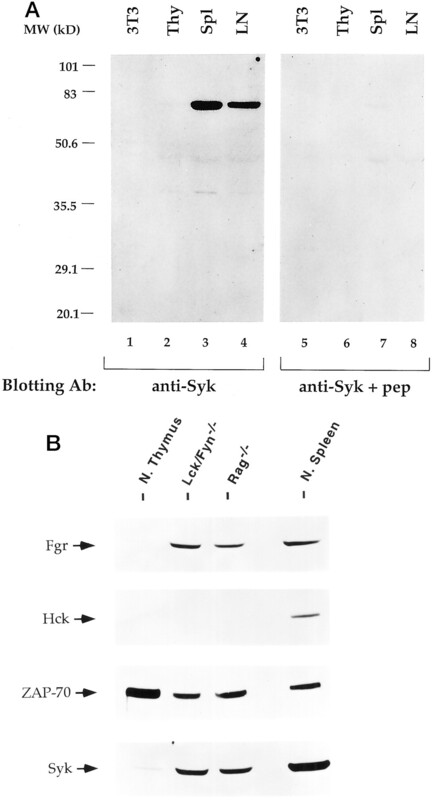 B, Immunoblotting for Syk in sorted thymocytes. Thymocytes from wild-type C57BL/6 mice were isolated and stained for CD4 and CD8 expression and sorted by flow cytometry. The sorted populations were 99% pure. Equivalent amounts of whole cell lysate (75 μg/lane) were resolved by 8% SDS-PAGE, transferred to membranes, and probed with the anti-Syk (5F5.2) mAb followed by a HRP-conjugated goat anti-mouse secondary Ab. Bands were visualized by enhanced chemiluminescence (ECL). The blots were subsequently stripped according to manufacturer’s instructions and reprobed with anti-ZAP-70 antisera followed by an HRP-conjugated protein A secondary reagent. Bands were again visualized by ECL. Lanes were loaded as follows: lane 1, sorted CD4−CD8− thymocytes (CD4-CD8−); lane 2, sorted CD4+CD8+ thymocytes (CD4+CD8+); lane 3, whole thymus (Thymus). The results shown are representative of three independent experiments. In CD4+CD8+ cells, Syk levels are substantially reduced (Fig. 3⇑A). These levels remain low in the progression to more mature CD4+ and CD8+ thymocytes as well as later when these cells emerge as mature T cells in the periphery (Fig. 3⇑A). The above results contrast with our previously published data using a rabbit heteroserum in which immunoblotting experiments suggested that Syk is expressed at highest levels in the CD4+CD8+ population (19). To address this issue further, we sorted CD4−CD8− thymocytes and CD4+CD8+ thymocytes for immunoblotting whole cell lysates with this new anti-Syk mAb and anti-ZAP-70 antisera for comparison. Whole cell lysates were generated from FACS-sorted cells that were 99% pure. (Fig. 3⇑B). The results we obtained with these Abs are consistent with the intracellular staining results: Syk levels are higher in the CD4−CD8− population and decrease in the CD4+CD8+ population (Fig. 3⇑B). In contrast, ZAP-70 is expressed throughout thymic development (Fig. 3⇑B; see also Ref. 19). The immunoblotting experiment (Fig. 3⇑B) also controls for differences in kinase expression due to differences in thymocyte size, as the lanes were normalized for protein content, not cell number. The reasons for the discrepancies in Syk expression between our previous results (19) and our current results are not clear. It is possible that in the previous experiments, contaminating Syk-expressing cells such as B cells were present in the enriched populations or, more likely, that the Syk heteroserum that had been previously used cross-reacted with a protein of similar size, perhaps ZAP-70. In mice, CD4−CD8− thymocytes can be further subdivided into subpopulations based on expression of the CD44 and CD25 cell surface proteins (2, 3). The expression of Syk within the CD4−CD8− population was analyzed. Using four-color analysis, wild-type thymocytes expressing CD4, CD8, CD3, B220, and Mac-1 were excluded. The remaining thymocytes were analyzed for CD44, CD25, and Syk expression (Fig. 4⇓A). From these staining results, it can be seen that Syk expression is elevated from the CD44+CD25− through the CD44−CD25+ stage (Fig. 4⇓A). After the CD44−CD25+ stage, Syk levels appear to be down-regulated, with a notable decrease in Syk expression by the CD44−CD25− stage, and uniformly low by the time the thymocytes have matured to CD4+CD8+ cells (Figs. 3⇑A and 4A). Interestingly, the CD44−CD25+ stage of thymocyte development corresponds to the stage at which thymocytes receive signals through the pre-TCR complex (3). Thus, it appears that Syk expression is elevated until the stage at which the pre-TCR signal is propagated and then its expression is rapidly down-regulated. Syk is down-regulated in murine thymocytes after the pre-TCR checkpoint. A, Syk expression in wild-type CD4−CD8− thymocytes. Thymocytes from a wild-type C57BL/6 mouse were cell-surface stained with biotinylated CD44, CD25 PE, CD3 TC, CD4 TC, CD8 TC, B220 TC, Mac-1 TC followed by streptavidin-APC. TC-positive cells were excluded by fluorescent gating. Syk expression in the different CD44/CD25 subpopulations is depicted in the histograms to the right of the dot plot. B, Syk expression in lck−/fyn− thymocytes. Thymocytes from lck−/fyn− mice were isolated and stained with anti-CD44 TC and anti-CD25 PE. Syk expression in the CD44/CD25 subpopulations, as measured by intracellular staining, is depicted in the histograms to the right of the dot plot. In A and B, the histograms represent the following intracellular stains: Syk 5F5.2 FITC, filled histogram (anti-Syk); Syk FITC + competitor peptide, open histogram, solid line (anti-Syk + pep); isotype-matched IgG1 FITC staining control, open histogram, dashed line (control Ig). Note that the differences in the maximal intensity of Syk staining in A and B are the result of using different flow cytometers. Four-color analysis in A was performed on a FACStarPlus, whereas three-color analysis in B was performed on a FACScan. The results shown are representative of three independent experiments. As shown in Fig. 1⇑, whole-cell lysates of thymocytes from Lck/Fyn-deficient mice and RAG-deficient mice appeared to express higher levels of Syk than wild-type mice. Because these mice are arrested in thymic development at the CD44−CD25+ stage (13, 14), we reasoned that the increased Syk expression seen in whole cell lysates results from the fact that the majority of thymocytes are arrested at the point when Syk is most highly expressed. We verified this hypothesis by staining for CD44 and CD25 in thymic populations from Lck/Fyn-deficient and RAG-deficient mice (Fig. 4⇑B and data not shown). As in the wild-type thymus, Syk was expressed most highly at the CD44−CD25+ stage and decreased in expression by the CD44−CD25− stage. Note that the differences in maximal Syk staining intensity between wild-type (Fig. 4⇑A) and mutant (Fig. 4⇑B) mice are the result of using different flow cytometers (see legend to Fig. 4⇑). We next sought to determine whether we could actively induce a pre-TCR signal to down-regulate Syk during the transition from CD4−CD8− thymocytes to CD4+CD8+ thymocytes. To do so, we used RAG− and lck−/fyn− mice. As mentioned above, the majority of thymocytes from these mice are arrested at the pre-TCR checkpoint during CD4−CD8− thymocyte development. Previous experiments in RAG-1-deficient mice have demonstrated that injection of anti-CD3 Abs can induce the arrested CD44−CD25+ thymocytes to mature into CD4+CD8+ thymocytes, presumably by cross-linking low levels of CD3 chains that have reached the surface in the absence of the pre-Tα and β-chains (36). Because Lck/Fyn-deficient mice are arrested at an identical stage in development, we wished to determine whether injection of anti-CD3 Abs would have a similar effect. We suspected that, similar to the case in SLP-76-deficient mice (37), in the absence of both Lck and Fyn, anti-CD3 treatment of these developmentally arrested thymocytes would not have an effect, because these thymocytes are missing critical mediators of the pre-TCR signaling pathway. Surprisingly, the CD4−CD8− cells from lck−/fyn− mice could be induced to develop, similar to the results observed in RAG− mice (Fig. 5⇓ and data not shown). These results demonstrate that the developmental arrest in these thymocytes can be overcome by the stimulation of the CD3 complex. In the Lck/Fyn-deficient thymocytes, the TCR β-chain was detected by intracellular staining even before Ab treatment (data not shown), suggesting that a functional pre-TCR complex can be generated in a subpopulation of these thymocytes, which may allow for further development of these cells. Induction of the CD4+CD8+ cells following anti-CD3 stimulation also resulted in TCR α-chain rearrangements, as detected by PCR assays (Fig. 6⇓), suggesting that the signal through the pre-TCR is generating bona fide CD4+CD8+ thymocytes. As can be seen from Fig. 6⇓, before anti-CD3 treatment, only TCR β-chains are rearranged, whereas after anti-CD3 treatment, α-chains are also rearranged. Note that in RAG-deficient mice, neither α- nor β-chains are rearranged, consistent with the function of the RAG genes in TCR gene rearrangement. The ability of anti-CD3-treated CD4−CD8− thymocytes to mature in the absence of both Lck and Fyn might reflect Syk functioning rather than ZAP-70 because of the decreased dependence of Syk on Lck/Fyn function (24), and because Syk is expressed in these cells. In vivo induction of maturation of CD4−CD8− thymocytes from lck−/fyn− mice leads to down-regulation of Syk expression. A, Syk expression in lck−/fyn− thymocytes. lck−/fyn− mice were injected with 250 μg normal hamster Ig i.p. in PBS. After 7 days, thymocytes from these mice were isolated and stained for CD4, CD8, and Syk. B, Syk is down-regulated upon in vivo treatment with anti-CD3ε Abs. lck−/fyn− mice were injected with 250 μg anti-CD3ε Ab (2C11) i.p. in PBS. After 7 days, thymocytes from these mice were processed as in A. 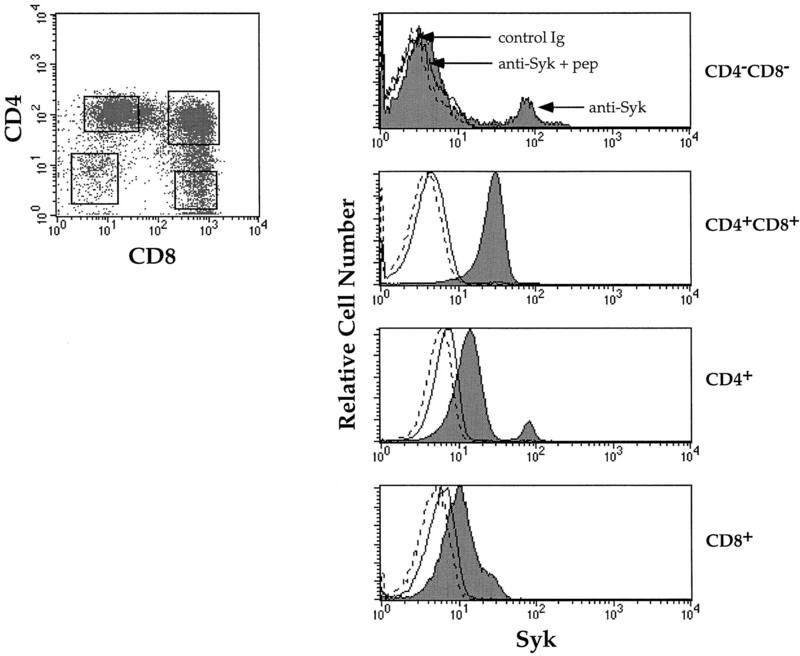 In both A and B, the histograms to the right of the dot plot represent Syk expression in the indicated gated populations: anti-Syk FITC, CD4−CD8− thymocytes, shaded histogram; anti-Syk FITC, CD4+CD8+ thymocytes, filled histogram. In addition, 5F5.2 FITC + competitor peptide staining was used as a negative control for staining (anti-Syk + pep, open histogram). The results shown are representative of six independent experiments. TCR gene rearrangements in anti-CD3-treated mice. 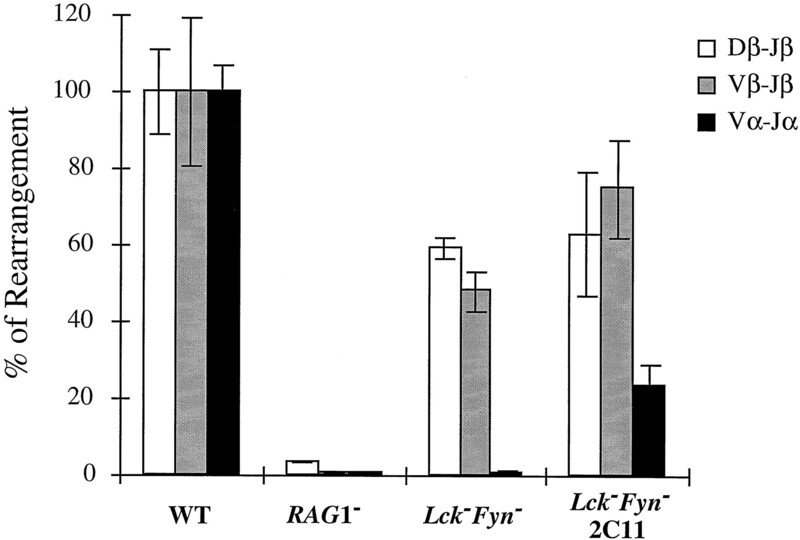 The histogram depicts quantitation of TCR-β and TCR-α rearrangements in adult thymus of wild-type (WT), RAG-1− and lck−/fyn− mice before and after 2C11 treatment. The amount of rearrangement is expressed as the percentage of the wild-type sample. The values shown correspond to the mean of independent PCR analyses using primers specific for two different Vβ (Vβ5 and Vβ8) and three different Vα (Vα2, Vα5, and Vα8) gene segments. The results shown represent the levels of rearrangements of individual animals: two wild-type samples, two lck−/fyn− samples before treatment, and six lck−/fyn− samples after anti-CD3 treatment. The background level of hybridization observed in a nonrearranging sample is given by the RAG-1− sample. The experiment shown is representative of two independent sets of experiments. To examine the expression of Syk during the CD4−CD8− to CD4+CD8+ transition, we stained for Syk intracellularly in the CD4−CD8− and CD4+CD8+ cells after in vivo anti-CD3 treatment of both lck−/fyn− and RAG− mice (Fig. 5⇑B and data not shown). 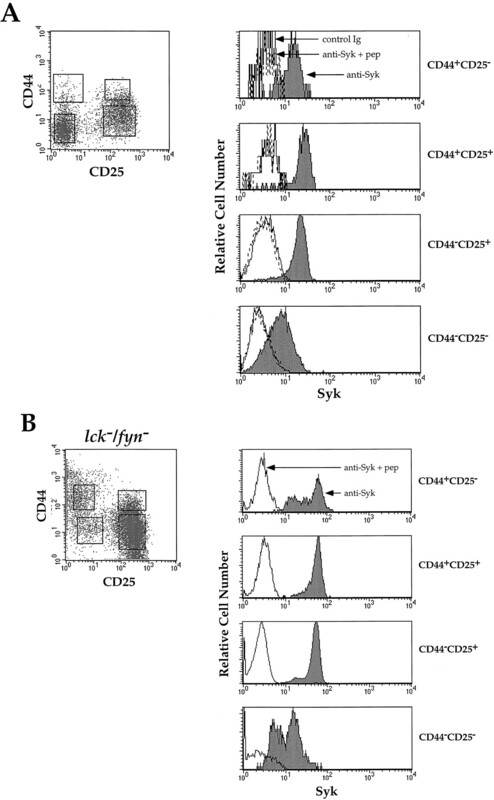 Consistent with the results observed in wild-type mice, the induced CD4+CD8+ thymocytes showed decreased levels of Syk expression compared with the CD4−CD8− thymocytes (Fig. 5⇑B and data not shown). Thus, Syk appears to be actively down-regulated following a pre-TCR signal during the CD4−CD8− to CD4+CD8+ thymocyte transition. The elevated levels of Syk at the CD44−CD25+ stage may allow anti-CD3 treatment to overcome the developmental block in lck−/fyn− and RAG− thymocytes. This result is especially noteworthy because Syk activation is less dependent than ZAP-70 on Src kinases (23, 24). Having determined that Syk is down-regulated during the CD4−CD8− to CD4+CD8+ transition in murine thymocytes, we were next interested in determining the pattern of Syk expression in the human thymus. We believed that regulation of Syk family members might differ between humans and mice, as suggested by the observations of ZAP-70-deficiency in mice and humans (15, 16, 17, 25, 26, 27, 28). Patients with SCID due to ZAP-70 deficiency have nonfunctional peripheral CD4+ T cells, whereas in mice, loss of ZAP-70 results in a complete arrest at the CD4+CD8+ to CD4+ or CD8+ transition. We reasoned that one possible explanation for the ability of human but not murine thymocytes to mature was a differential regulation of Syk expression in humans. To examine more closely the expression of Syk in human thymocytes, we used an anti-Syk mAb that we have used for immunoprecipitation and immunoblotting of human Syk (Ref. 30 and data not shown]. When used for immunoblotting, this Ab detects Syk in lysates of human thymocytes as well as PBLs (Fig. 7⇓A). To assess whether this Ab was also capable of staining Syk intracellularly, we costained B cells from human PBLs with Abs against surface CD19 and intracellular Syk. Syk could be stained in this population of cells, and the specificity of staining once again was demonstrated by the ability of specific peptide to compete with the staining (Fig. 7⇓B). The 4D10.1 anti-human Syk mAb can detect intracellular Syk. A, Blotting specificity for human tissues. Whole cell lysates were made from the indicated tissues or cell lines and quantitated for protein content. Equivalent amounts of lysate (100 μg) were loaded in each lane resolved by 10% SDS-PAGE. Gels were transferred to PVDF membranes and probed with an anti-human Syk mAb (4D10.1) followed by an HRP-conjugated goat anti-mouse secondary Ab. Bands were visualized by ECL. The lanes were loaded as follows: lane 1, whole thymus (Thy); lane 2, PBL; lane 3, Jurkat, J.E6-1 clone (Syk-deficient, J.E6-1); lane 4, Jurkat, J.D clone (Syk-expressing, J.D); and lane 5, Raji B cell line (Raji). The results shown are representative of five independent experiments. B, Intracellular staining of human Syk. Human PBLs were isolated by Ficoll/Hypaque separation. Cells were washed and stained on the cell surface using CD19 TC and intracellularly using 4D10.1 FITC (anti-Syk); 4D10.1 FITC + competitor peptide (anti-Syk + pep); and isotype-matched IgG1 FITC staining control (Control Ig). CD19+ cells were gated and analyzed for Syk staining. The results shown are representative of 15 independent experiments. To analyze the expression of Syk during human thymic development, thymocytes from human thymi were stained for surface CD4 and CD8 expression, as well as intracellularly with the anti-Syk mAb 4D10.1. As can be seen in Fig. 8⇓, in the normal human thymus, similar to the mouse thymus, an elevated level of Syk expression was present in a subpopulation of CD4−CD8− cells; in this case, a smaller subset express high levels of Syk. Syk levels remained somewhat elevated even in the CD4+CD8+ until the transition to either the CD4+ or CD8+ stage, where a majority of these thymocytes showed decreased Syk expression. Strikingly, and in dramatic contrast to the murine thymus, 5–10% of the CD4+ thymocytes expressed substantially elevated levels of Syk (Fig. 8⇓). To confirm the Sykhigh cells that we observed in the CD4−CD8− and CD4+ populations were thymocytes and not other contaminating cell types, we examined forward and side scatter gating, indicating that the Sykhigh cells were small lymphocytes (data not shown). 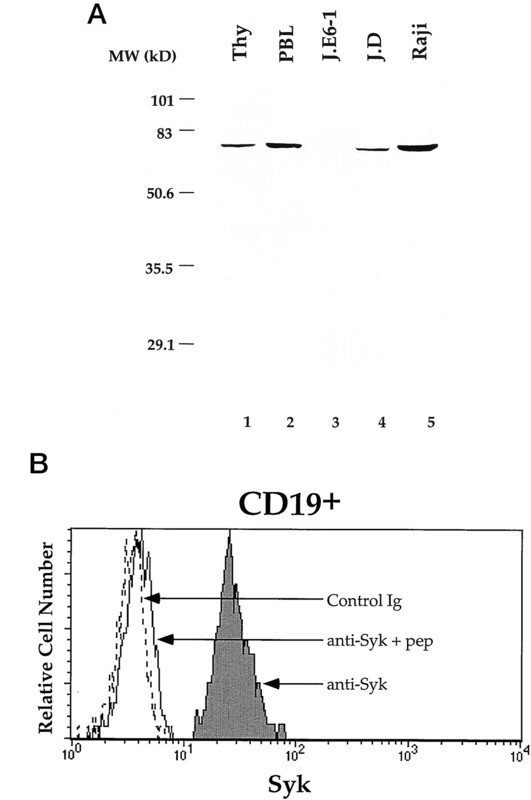 Exclusion of CD19+ and Mac-1+ (CD11b) cells by fluorescence gating indicated that the CD4−CD8− and the CD4+ cells with elevated Syk expression were not B cells, macrophages, or monocytes (data not shown). 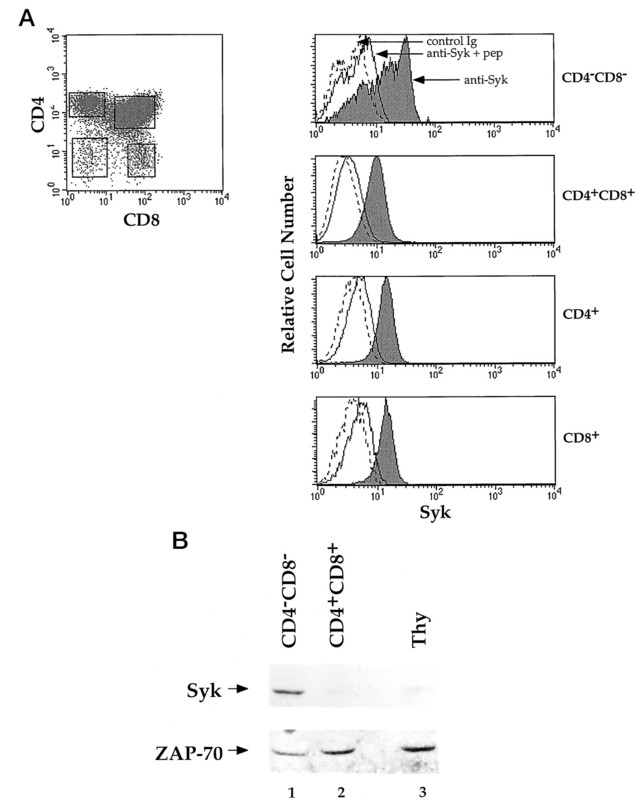 Human thymocytes express elevated levels of Syk in a subpopulation of CD4−CD8− and CD4+ cells. Human thymocytes were stained on the cell surface with anti-CD4 TC and anti-CD8 PE Abs. Syk expression in the CD4/CD8 subpopulations, as measured by intracellular staining, is depicted in the histograms to the right of the dot plot: 4D10.1 Syk FITC, filled histogram (anti-Syk); Syk FITC + competitor peptide, open histogram, solid line (anti-Syk + pep); isotype-matched IgG1 FITC staining control, open histogram, dashed line (control Ig). The results shown are representative of 12 independent experiments. We hypothesized that this subpopulation of CD4+ thymocytes might represent a subset of cells that become precursors for the human CD4+ peripheral T cells that develop in ZAP-70-deficient patients. Alternatively, we considered the possibility that the CD4+ thymocytes were an immature thymic population that is an intermediate between CD4−CD8− and CD4+CD8+, as has been described in studies of human thymocyte development (38). Unlike the murine system, in which thymocytes develop from CD4−CD8− cells to CD4+CD8+ via a CD8+ intermediate, human thymocyte development proceeds through a CD4+ intermediate during the transition from CD4−CD8− to CD4+CD8+ thymocytes. To assess whether the small subpopulation of CD4+ cells expressing elevated levels of Syk was immature or mature, we examined their CD3 expression. Mature CD4+ thymocytes express high levels of CD3, whereas the immature CD4+ intermediates express low levels of CD3. CD4 vs CD3 staining indicated that, in fact, the CD4+ Sykhigh cells expressed low levels of CD3 and therefore represent the CD4+ developmental intermediates between CD4−CD8− and CD4+CD8+ populations (Fig. 9⇓). A comparable population of Sykhigh cells in CD8+ thymocytes was not detected (data not shown). The expression of Syk in the CD4+CD3low population corroborates the idea that Syk is expressed in immature cells and decreases in expression as thymocytes mature. Sykhigh human CD4+ thymocytes are immature. Syk is elevated in a subpopulation of CD4+CD3low cells. Human thymocytes were stained on the cell surface with anti-CD4 TC and anti-CD3 PE Abs. Syk expression in the CD4/CD8 subpopulations, as measured by intracellular staining, is depicted in the histograms to the right of the dot plot: 4D10.1 Syk FITC, filled histogram (anti-Syk); Syk FITC + competitor peptide, open histogram, solid line (anti-Syk + pep); isotype-matched IgG1 FITC staining control, open histogram, dashed line (control Ig). The results shown are representative of five independent experiments. In contrast to murine thymocytes, in which the pre-TCR is expressed during a discrete period of CD4-CD8− thymocyte development, only a small number of human CD4−CD8− thymocytes express the pre-TCR. Instead, it appears that it is during the CD4+ intermediate stage that the human pTα-chain and the pre-TCR are most highly expressed (39). Thus, the CD4+ intermediate stage in humans appears to correspond functionally to the CD44−CD25+ stage of murine CD4−CD8− cells. It appears the elevation of Syk expression during pre-TCR signaling has been preserved between mice and humans, and that Syk is down-regulated following the pre-TCR signal. Note also that CD3int cells, contained within the CD4+CD8+ stage of development, again have higher levels of Syk than the more mature subset. This higher level of Syk expression in CD4+CD8+ human thymocytes may be important for the ability of CD4+ cells to develop in ZAP-70-deficient patients. We have described a new Ab and have used cytoplasmic staining and flow cytometry for detecting the Syk PTK in subpopulations of cells. Using this method, we have analyzed the expression of Syk during thymic development. In mice, Syk expression is elevated before pre-TCR signaling and is then quickly down-regulated. In humans, Syk expression is up-regulated in a small subpopulation of CD4+ cells that correspond to pre-TCR-expressing cells, is down-regulated somewhat at the CD4+CD8+ stage, and further down-regulated at the single positive, CD4+ or CD8+, stages. These results highlight a potential role for Syk in pre-TCR signaling. As we have noted, Syk appears to be highly expressed in CD4−CD8− thymocytes, in contrast to our previously published results (19). We have confirmed the elevated expression in CD4−CD8− using our anti-Syk mAb both by intracellular staining and by immunoblot analysis of sorted thymocyte subpopulations. Because the analyses performed in this report utilized mAbs reactive with Syk, rather than a rabbit anti-peptide heteroserum, and analyzed Syk at the single cell level as well as by Western blotting, it is likely that the result contained in our previous report relating to Syk expression in murine thymic subsets was incorrect. Moreover, we have further shown that Syk is expressed at highest levels in the thymus in the CD44−CD25+ stage in the CD4−CD8− thymocyte compartment. The expression of Syk in CD4−CD8− thymocytes raises the possibility that Syk may be involved in pre-TCR signaling. A role for Syk in pre-TCR signaling has been suggested by prior genetic data (20). Although ZAP-70 deficient thymocytes progress to the CD4+CD8+ stage, thymocytes from Syk/ZAP-70 doubly-deficient mice are arrested at the CD44−CD25+ pre-TCR checkpoint in CD4−CD8− thymocytes (15, 16, 17, 20). Thus, expression of Syk in the absence of ZAP-70 appears to be sufficient for progression to the CD4+CD8+ stage. As we show here, Syk is in fact expressed at its highest levels just before the CD4−CD8− to CD4+CD8+ transition, at the CD44−CD25+ checkpoint. The expression of Syk at the pre-TCR signaling stage has apparently been preserved between mice and humans. Examination of the expression of the human pTα has revealed that this gene, and also the human pre-TCR complex, is first expressed at the CD4+ intermediate stage (38). The TCR α-chain is not rearranged until after the CD4+ intermediate thymocytes have become CD4+CD8+ thymocytes, presumably after a pre-TCR signal. We demonstrate that Syk is strikingly elevated in the immature CD4+ thymocytes in which pre-TCR signaling is thought to occur. The conservation of Syk expression and the pre-TCR in both mice and humans suggests that Syk and the pre-TCR may in fact be functionally linked. In mice, Syk is down-regulated as CD4−CD8− cells become CD4+CD8+ cells. We have demonstrated this both by our observations of Syk expression in wild-type thymocytes, as well as by inducing developmentally arrested CD4−CD8− Lck−/Fyn− thymocytes to mature with an artificial stimulus. The fact that anti-CD3 treatment of Lck/Fyn doubly deficient thymocytes allows for development past the pre-TCR checkpoint is surprising, given that Src family kinases are thought to be critical for initiation of the pre-TCR signal. Our results showing that Syk is expressed at high levels at the pre-TCR thymocyte stage (Figs. 4⇑ and 5⇑), as well as previous observations from our lab and others that Syk is less dependent on Src family kinases than ZAP-70 (23, 24), suggest that Syk may be allowing the anti-CD3 treatment to overcome the block in development in the case of Lck/Fyn deficiency. Indeed, Syk can be activated in ZAP-70-deficient thymocytes (17), suggesting that Syk can be activated following a pre-TCR signal. Interestingly, in vivo treatment of SLP-76-deficient mice does not induce progression past the CD4−CD8− stage. This result would be expected, because SLP-76 is a substrate for both Syk and ZAP-70, and therefore in the absence of this common critical downstream substrate, further development cannot occur. Because of the down-regulation of Syk expression after pre-TCR signaling, only low amounts of Syk remain at the CD4+CD8+ stage, when positive and negative selection occur. Therefore, in ZAP-deficient CD4+CD8+ thymocytes, Syk is not expressed at sufficient levels, so positive and negative selection cannot occur. However, in ZAP-70-deficient mice in which a Syk transgene is constitutively expressed throughout thymic development, complete thymic development is restored, indicating that, if expressed at sufficiently high levels, Syk can compensate for ZAP-70 at later stages of development (22). In humans, the down-regulation of Syk expression is not as complete following pre-TCR signaling (Fig. 8⇑). The fact that CD4+CD8+ human thymocytes still express significant levels of Syk may explain the differences between the severity of the developmental phenotype of ZAP-70-deficient mice and humans. Because Syk is more abundant in human than in murine CD4+CD8+ cells, it may be able to compensate for the loss of ZAP-70 more effectively in human than in murine thymocytes, thereby allowing the development of some human CD4+ thymocytes despite the lack of ZAP-70. This subpopulation of CD4+ thymocytes would then become the CD4+ peripheral T cells observed in ZAP-70-deficient patients. However, because Syk expression is down-regulated in peripheral T cells, the CD4+ T cells that develop in ZAP-70-deficient patients remain unable to signal (25, 26, 27, 28). The signal that causes Syk to be down-regulated has not been identified. It is possible that the signal is a direct result of pre-TCR signaling, but it may be that another signal, perhaps delivered via a cytokine receptor, is responsible. Analysis of the syk promoter may indicate what types of transcriptional regulation control Syk expression. The proposed function of Syk during pre-TCR signaling is consistent with the idea that Syk, when compared with ZAP-70, has a decreased dependence on Lck/Fyn function (23, 24, 40). One in vivo example of a situation in which Lck plays less of a role in TCR signaling is during coreceptor-independent signaling. In such situations, the TCR can signal in the absence of CD4 or CD8 coreceptors and therefore in the absence of the Lck molecules that are associated with the cytoplasmic tails of those coreceptors. Pre-TCR signaling is by definition coreceptor-independent, because it occurs in the absence of expression of either CD4 or CD8, at least in the murine system. Thus, during pre-TCR signaling, because CD4 and CD8 are not expressed, Lck is not recruited to the CD3 signaling complex as efficiently. Based on the observed differences in regulation of expression and kinase activity of Syk and ZAP-70, we propose the following model. Syk and ZAP-70 both function during thymocyte development, but they are most critical during different stages. Their individual characteristics are appropriate for the delivery of two different types of signals through the thymocyte receptor complex. Conveniently, the expression of these kinases correlates with the time in development when they are proposed to be most useful. The pre-TCR appears to be less discriminating than the mature TCR in terms of signal initiation: a truncated pre-TCR lacking extracellular domains can restore thymic development in a RAG-deficient background, suggesting that no specific ligand-binding is necessary for stimulation of the pre-TCR (10). On the other hand, the TCR/coreceptor complex is responsible for discriminating ligand affinities over a wide concentration range. Syk is less dependent on upstream activators than ZAP-70: it is capable of autophosphorylation on its activation loop tyrosines, and it can function independently of CD45 or Lck (24, 41, 42). ZAP-70, in contrast, relies on transphosphorylation by Lck and Fyn for activation (43). Thus, Syk can more readily act as a signaling molecule during the pre-TCR signaling process and is expressed at the pre-TCR, but not the TCR, signaling stage. Conversely, ZAP-70 is likely to be more important during the processes of positive and negative selection at the CD4+CD8+ stage, when differences in the strength of the TCR signal are important to transmit and therefore tighter regulation of signaling is required. Although Syk-deficient mice have no severe defect in thymocyte development (44, 45), the efficiency of pre-TCR signaling and thymocyte development, as well as potential effects on repertoire development, have not been studied in these mice. Thus, it still remains possible that Syk may play an unrecognized specialized role in more efficient signal transduction by the pre-TCR, but not the mature TCR, in the thymic development. Our observations further demonstrate a sensitive and powerful application of the combination of intracellular staining and flow cytometry for the study of signaling proteins in situations in which cells must be analyzed at high purity or at limiting cell numbers. We thank Drs. Anthony DeFranco, Nigel Killeen, and Deborah Yelon for helpful discussions and critical reading of the manuscript. ↵1 This work was supported in part by the Medical Scientist Training Program (D.H.C. ), the National Institutes of Health (N.v.O. and A.W. ), and the Howard Hughes Medical Institute (A.W.). ↵2 Current address: Department of Microbiology, University of Texas Southwestern Medical Center, Dallas, TX 75235. ↵4 Abbreviations used in this paper: pTα, pre-Tα; PTK, protein tyrosine kinase; TC, tricolor; APC, allophycocyanin; PVDF, polyvinylidene difluoride. Harlow, E., D. P. Lane. 1988. Antibodies: A Laboratory Manual 522 Cold Spring Harbor Lab. Press, Plainview, NY. Coligan, J. E., A. M. Kruisbeek, D. H. Margulies, E. M. Shevach, and W. Strober. 1994. Labeling antibody with fluorescein isothiocyanate (FITC). In Current Protocols in Immunology. Vol. 1. R. Coico, ed. John Wiley & Sons, NY, p. 5.3.2.